An analogue BBD (bucket brigade device) with its anti-aliasing and reconstruction filters. Effects can play just as important a role in sound creation as the elements in a synth's signal path — provided you have access to their constituent parts. We take a closer look at effects synthesis with simple delays. 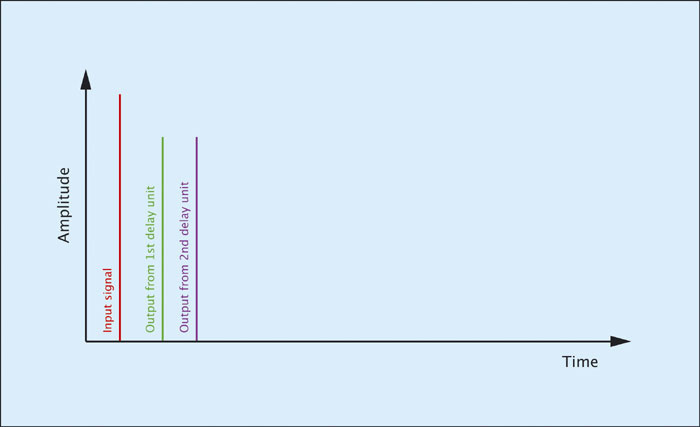 For the past two months, I've been describing the nature of delay lines; what they are, and how they work. Having done so, I'm going to make good my promise to show how we can use these to create many of the effects used in today's music, starting with various forms of echo and an unusual reverberator. You may be wondering what place this discussion has in a series on synthesis. Well, firstly, most synthesizers have some form of effects unit(s), and I'm not just talking about digital workstations with their zillions of insert and master effects. From the earliest days of synthesis, experimental modular instruments offered spring reverbs, and many of the revered monosynths from the 1970s — the ARP 2600, EMS VCS3, and umm... the Teisco S100P — did likewise. Admittedly, the practice lost favour for a while, but when bucket-brigade devices (or BBDs) became affordable, the effects that they made possible signalled the introduction of new breeds of synthesizer. Most obviously, ensembles or 'string machines' appeared in large, usually Italian, herds. Simultaneously, chorus units and flangers (which are also effects using delay lines) started to appear on instruments such as the ARP Quadra, the Korg Trident, and the Roland Jupiter 4. But I think that there's an even more important reason to discuss effects here. Just as modern synthesizers provide hundreds or even thousands of presets, and have been blamed by many for the demise of innovative sound programming, modern effects units have scores of presets, and can equally be blamed for the demise of innovative effects programming. Indeed, many modern effects units — from the humble stomp box to sophisticated studio systems — offer a fixed architecture, and turning the knobs just changes the values of the parameters within that architecture. Some recent products offer variable architecture, allowing you some freedom in how you order different effects blocks in your effects patches, but this is still not the same as having access to the basic building blocks of effects synthesis, and being able to build new, innovative effects structures. Given the huge transformations that effects can wreak on your synth sounds, if you're reading Synth Secrets for ideas on creative sound programming, surely you should extend the same philosophy to your effects? Digital & Analogue — What's The Difference? Having spent much of last month's Synth Secrets explaining the operation of a digital delay, and then pointing out how conceptually similar this is to an analogue bucket-brigade device, it's important to point out that they often sound very different. Most of us know this, of course, and know too which side of the analogue versus digital debate we come down on. But this raises a question whose answer is often assumed, but rarely explained. It's this: "Given the conceptual similarities between analogue and digital delays, why is it that they often sound so different?". The opening diagram and the one below show the aforementioned delays: an analogue BBD with its anti-aliasing and reconstruction filters, and a digital delay line with its associated A-D and D-A converter. As you can see, the two are equivalent, with a stream of samples moving from the input on the left to emerge unmodified on the far right. 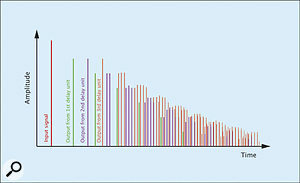 So, if the sample rate and number of stages are the same in each, why do they sound so different? A digital delay line with its associated A-D and D-A converter. The answer lies in the degradations that occur as the signal passes down the line. If there is no failure in the digital delay line, the same data will arrive at the D-A converter as left the A-D converter, so the only changes that occur when comparing the audio input to the audio output (other than delay, of course) are those imposed by the limitations of the converters themselves. In contrast, each Sample & Hold stage in the analogue bucket-brigade device will be affected by the limitations of the capacitors and by electronic noise, so each stage will add or subtract a small voltage from each sample. These errors are cumulative, and although an amount of positive voltage noise added in one place might be cancelled out by a bit of negative voltage noise in another, every sample will be modified by the time it reaches the reconstruction filter. If the errors are random, the resulting signal will sound the same as the original with the addition of white noise, but more often than not, there will be some form of systematic error introduced. Whether you view these differences between the input and the output as a problem or a benefit, however, depends on the kind of sound you favour, and possibly the prevailing wind of current fashion! Figure 1: The simplest electronic delay represented as a tape delay.I'm going to start looking at what you can do with delays by returning to an analogy I made in passing two months ago. In its simplest incarnation, you can think of a delay line as a tape recorder with an infinitely long strip of tape passing across a record head and then across a replay head (see Figure 1, left). 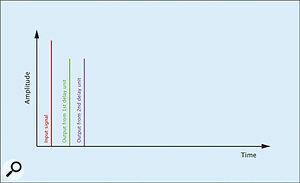 The length of the delay is determined by the distance between the heads, and the speed of the tape as it runs between them. As analogies go, this is a good one. If this were the only type of delay that we could create using electronics, it would not be a very interesting piece of technology. But let's now imagine that we can 'tap' off the signal before it reaches the end of the line. This would enable us to create two delayed signals — one that occurs as the input signal passes the first tap, and another as it reaches the end of the line. Figure 2: A two-tap delay line.The analogue circuit for this is shown in Figure 2, in which the circle with the 'plus' sign inside is a mixer. I'm sure that you can imagine how the digital equivalent would look; it would require a data tap in each register between the fourth and fifth 'D' flip-flops on the schematic I drew at the end of last month's instalment of this series. But since I would have to invent the 16-bit digital mixer to draw this for you, I think that I'll stick with analogue for the moment! Figure 3: The two-tap delay line shown as a block diagram.If I redraw Figure 2 in standard Synth Secrets fashion, I create Figure 3 (see right), which shows the delay elements on either side of the tap as two separate delay lines. This is not as strange as it may seem... there are numerous products that arrange two BBDs in series to generate delays of the required length, with or without taps between them. By the way, you may have noticed that I've removed the anti-aliasing and reconstruction filters from Figure 3, but that's not because I've removed them from the circuit. I'd like you to assume that they are in place, because I'm going to omit them from all the following diagrams for the sake of simplicity. L Figure 4: Adding the original signal to the delays.et's now consider what Figure 3 does to audio passing through it. If we present a single impulse (a 'ping') to the input, we obtain 'pause... ping...pause...ping' at the output. Interesting though this is, it's not very musical, because the initial 'ping' — whether sung or played on an instrument — is lost, and if you played this on the beat, the first 'ping' that you would hear would trail the beat by the length of the first delay line. So we add another signal path that carries the original signal directly to the mixer, as shown in Figure 4. Now we obtain 'ping...pause... ping...pause...ping', which is much more musical. The tape delay achieves the same effect by using two playback heads and directing part of the input signal to the output, as shown in Figure 5. At this point, it's worth noting that there's nothing stopping you from making the lengths of the two delay lines — or the distances between each of the tape heads — unequal, so this system also allows you to produce syncopated delays. Now we're getting somewhere! 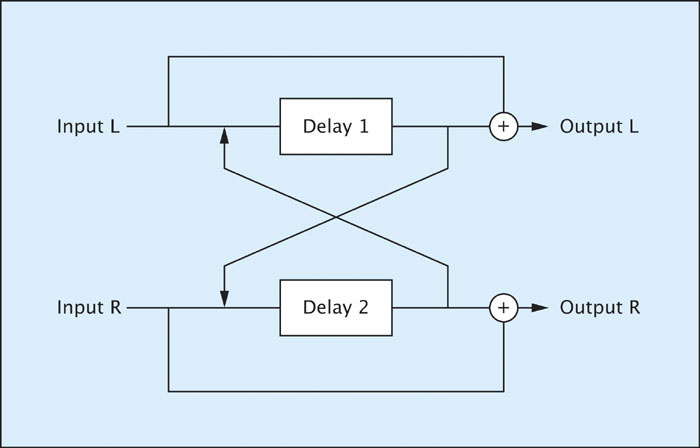 Figure 5: Figure 4 implemented as a tape-delay system. Figure 6: A tape-echo loop.Developing this idea further, many tape echo units possess more than two playback heads, with three or four being the norm. However, they do not use infinitely long strips of tape, substituting instead a loop that passes endlessly over the record and playback heads, as shown in Figure 6. Unfortunately, this idea has a serious flaw. If you were to record a 'ping' on to the tape, it would be tapped off by the three playback heads, then reappear at them a short time later, and then again, and again, and again... ad infinitum. If further pings are added as time passes, you end up with sonic mush. Likewise, if you record a continuous signal such as a voice or a guitar, mush again ensues. The answer to this problem is to add an erase head that removes some or all of the signal from the tape each time it passes (see Figure 7, below). If it erases the tape fully, we obtain just three delayed pings. If it erases the tape partially, we hear groups of three pings, with each successive group diminishing in loudness until they disappear into the noise floor. As you would expect, this sounds rather pleasing, so this architecture has become the basis of all professional tape-delay systems. Figure 7: A usable tape delay system. You can achieve the same result using delay lines, although the block diagram for this (see Figure 8, below) is already starting to look a little complex. The key element is the amplifier in the feedback loop, which is often labelled 'Regeneration' on basic echo units. With a gain that ranges from 0 percent (which is analogous to total erasure) through to 100 percent (which would be the situation if the erase head were removed) you can create the same range of effects as you would obtain from a tape-echo system. 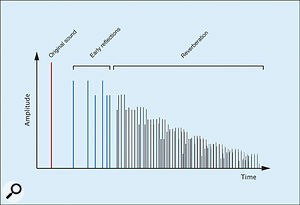 In practice, the degradation in BBDs will soon turn a re-re-re-repeated 'ping' into a sonic splodge, as will a tape that is being partially erased each time it loops, so there is a practical limit to the number of repeats you can obtain unless you use digital delays — which is, of course, what most of us now do. Figure 8: Representing the tape delay as a block diagram. We could of course recreate the effect of Figure 8 in a modern effects unit quite quickly, but although that would be simple, some of the effects I'm planning to talk about require a level of control not available in all effects units. So let's consider instead how we might go about recreating Figure 8 inside a synth (see Figure 9). In my case, this means turning to my trusty Analogue Systems RS Integrator modular system, but of course there are plenty of other solutions, in both analogue modulars and modern digital or software-based synths, with which you can achieve the same degree of control. Figure 9: Creating Figure 8 using synthesizer modules. Figure 10: Setting the RS390 to act as a simple delay line.However, the delay module I've chosen is the RS390, a digital delay line with dual (left/right) outputs, and user control over the relative loudness of the original and delayed signals. 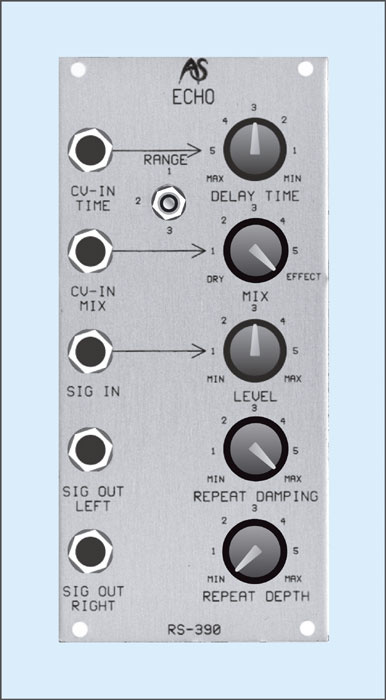 To construct the patch correctly, we need to select just one output from each of the three modules (I've chosen the left output), set the Mix control to 'Effect', the Repeat Depth control to its minimum and the Damping control to maximum, as shown in Figure 10. The first of these ensures that we obtain nothing but the effected signal from each module, and the others ensure that the internal regeneration of each RS390 is set to 'zero'. Each of the RS390 delay lines has an internal clock, so I have synchronised them by setting all the Delay Time knobs to the same position ('Max') and then controlling them using a single voltage derived from the CV generator/shifter in an RS50. OK, I admit that it's not the simplest of patches, but if you make all the connections — blue and green for audio, plus red for CVs — you'll find that it, or something akin to it on your synth of choice, recreates Figure 8 accurately. Firstly, consider the audio, which I have divided into two parts: blue cables for I/O, and green cables to denote the path through the delays as well as the regeneration loop. The input is distributed to two destinations. The upper cable takes the signal to a mixer (the second module from the left), while the lower takes it to the output mixer on the far right. The 'upper' signal passes from the mixer to the first echo module, the output from which is passed via a multiple to the second echo module and to the output mixer. Likewise, the output from the second echo module passes to both the third echo module and the output mixer. The output from the third echo module passes via the rightmost multiple to the input mixer on the left of the figure (thus creating the regeneration loop) and to the output mixer. Secondly, consider the control voltages, which are denoted by the four red cables. 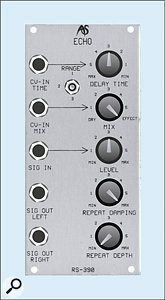 The CV Shifter allows you to determine a control CV for the Delay Times of each of the echo units. I have directed the output from this to a CV buffer that then distributes the voltage to the CV-In Time inputs on each of the delays, thus allowing us to control all three units using a single control. Of course, there's nothing stopping us from creating offsets between each of the delays, simply by setting the Delay Time knobs and/or Ranges differently on each. 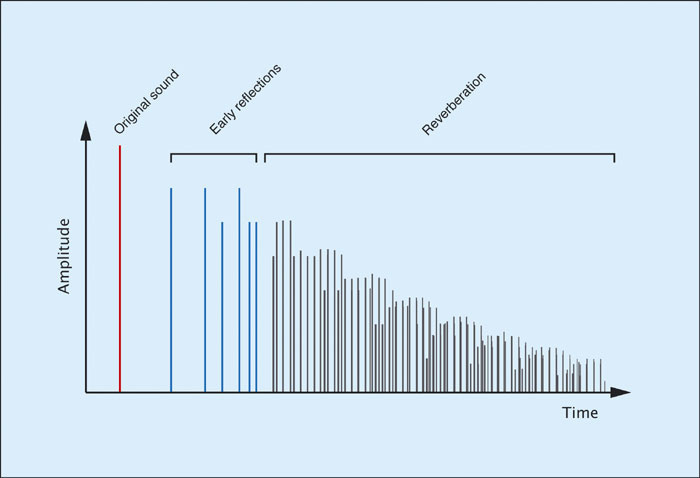 Figure 11: A 'ping-pong' delay. 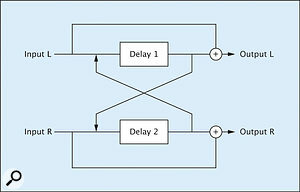 Figure 12: Patching the 'ping-pong' delay. 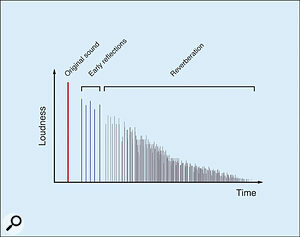 Figure 13: Two delays without regeneration.Despite their power in certain areas, tape delays and simple delay lines suffer from a significant limitation: each delay line produces a single, discrete echo. 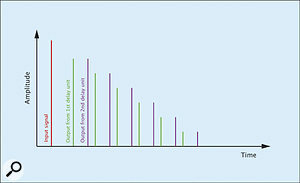 So the complexity of the resulting sound is, well... not complex at all. 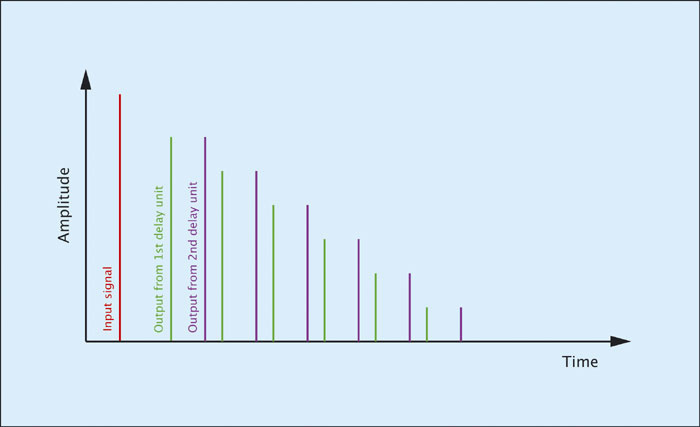 If there is no regeneration in the feedback loop, we can represent the output from two delay lines — say, the first two in Figure 9 — as shown in Figure 13 (right). But the RS390 is not a simple delay line, and there are plenty of more complex alternatives, particularly in software-based synths, that allow us to be more ambitious. In my patch, the first RS390 alone is capable of producing a string of delays and then presenting them to the second RS390 (we get it to do so by increasing the Repeat Depth by a suitable amount). 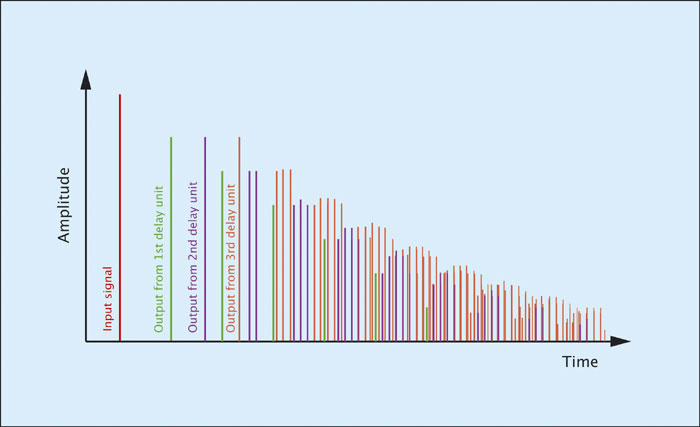 If we now consider the output of this, we obtain something that looks like Figure 14. Figure 14: Using Delay Line 2 to echo a series of echoes produced by Delay Line 1. This is more pleasing, but still sounds like a discrete sequence of echoes. So let's now set up the second delay unit to create a stream of echoes, just like the first. To make the result interesting, we need to set the delay times on each unit differently, or all the echoes will fall at the same time. 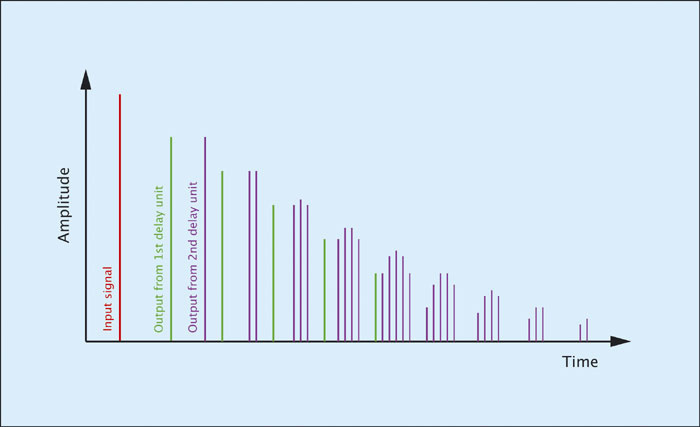 If the second unit is repeating slightly more quickly than the first, the result looks like Figure 15. 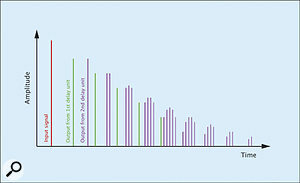 Figure 15: Producing a stream of echoes for each of a stream of echoes. Figure 16: Producing even denser streams of echoes using all three delay lines.Now comes the final touch, as we introduce a third delay unit, or, in my patch, the third RS390, set to an even shorter delay time than the previous two, and set to produce a stream of echoes from each of the echoes in Figure 14. The result, drawn in Figure 16 (right), looks suspiciously like the reverberation in Figure 18, which I've copied unmodified from the February 2001 instalment of Synth Secrets, where we discussed reverb in some detail. Indeed, if I recolour Figure 16 to illustrate the division between the early reflections and reverb tail (see Figure 17 below) you can see that the relationships are preserved remarkably accurately. OK, I'll admit that the result lacks some of the qualities of true reverberation, and that it sounds somewhat 'electronic', but it would definitely sound like reverb to most people, and would not be perceived as a complex set of echoes. Figure 17: Creating reverb using three delay units with regeneration.Yet this isn't the end of the story, because if the delays in this patch are short enough for the early reflections to sound realistic, and for the echoes to be dense enough to sound reverberant, the tail in Figure 18 will be rather more 'bathroom' than 'Grand Canyon'. So now we invoke the patch-cord regeneration loop in Figure 9, sending the whole thing round and round to become ever more complex as it decays. The echoes soon turn into a cloud of thousands or even millions of indistinguishable repeats, which is, of course, exactly what natural reverb is. Nonetheless, the effect still exhibits a somewhat 'metallic', sound because the delay times in each RS390 are constant, so there are three, enharmonic, characteristic frequencies present. The same happens in spring reverb, where the longitudinal, latitudinal and torsional vibrations provide three modes of vibration, which is why spring reverbs have that metallic ring to them. But the results can be extremely useful as novel effects rather than as precise recreations of acoustic spaces. If you're lucky enough to be using delay units that possess dual left/right outputs (as do the RS390s I've used this month), you can increase the reality of the effects still further. 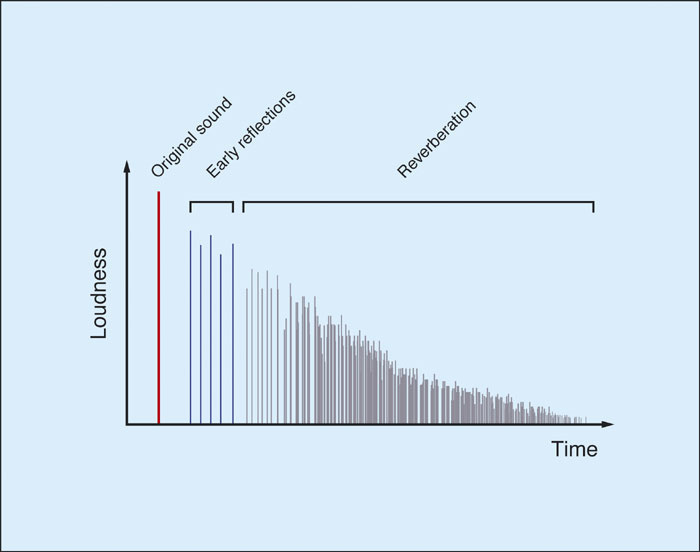 This is because natural reverberation in a room produces subtly different results at each of your ears. If it did not, it would be like listening to a monophonic recording through a stereo system; despite the fact that the sound is coming from two sources, there is no feeling of spaciousness. This is also one of the reasons why concert halls have high ceilings... they ensure that the early delays do not reach each ear simultaneously by way of the ceiling, but at different times by way of the walls. Anyway, by adding a couple of additional mixers and repatching the RS390s in Figure 9 to take advantage of the dual outputs, you can transform what started out as a simple recreation of a three-head tape delay into a remarkable stereo reverb unit. Don't you just love this stuff?